Not yesterday, but the last few rows were worked early this morning, and now it's done. Well almost done—there are still a dozen or so ends to weave in Weaving in end from a loosely spun single ply yarn like this is an easy job—the yarn is very “grabby” and ends will be easy to hide. I love the look of it, the colors, and the movement of the colors... The yarn wasn't cheap, but it reaffirms my love of long color yarns. One of these days, some Zuberball, or some Kauni or some other long color changing yarn –a BIG ball or several, or a cone—is going to find its way home with me. That will be someday, when my ship comes in. In spite of the power wash, (and my previous efforts) there are still bits of smeared paint on the brick walls. (Left over graffiti from the previous owners--How could they let their kids do that?) Painting the brick is not permitted, nor are permanent changes, but lattice is light weight, easy to install, and removable. It will also be brighter (than red brick) and be cooler—the red brick absorbs a good deal of heat in the late afternoon sun. With some furring strips behind, and some planters mounted in front,(the furring strips will be the real support for planters), and a bracket for my wind chimes, and a new light—well-- it will be a lovely out door room for my enjoyment. All this (lattice work) needs to be done before the chairs and table and planters go back out there. And I can't wait to get all the planters and terrace furnature out of the living room and back on the terrace where it belongs! I've thought about doing this for years, and now is the perfect time—I have a few extra cents, and a clean and clear terrace to work with. I've already spend some money on bathing suits. My old ones are too big—and so stretched out that they were too big last year before I lost weight. The notice came about the pool last week, but payment isn't due till the end of May. I'll get a NYC tax rebate check will arrive before then, and it will be just about the right amount for the pool membership. Which at under $200 for the 3 months of the summer,--May 26th to Sept 3rd--is a bargain I can't pass up. I've got a brisk walk of at least 20 minutes (some days, twice that) 6 days of last week—but water aerobics is much more fun—exercise I will do, happily. And I have nothing to report on sewing—just after I posted on Saturday, my daughter called, and we went shopping for some craft ideas for the wedding. I was a wonderful way to blow all my plans for the day! I LOVE this scarf Helen. 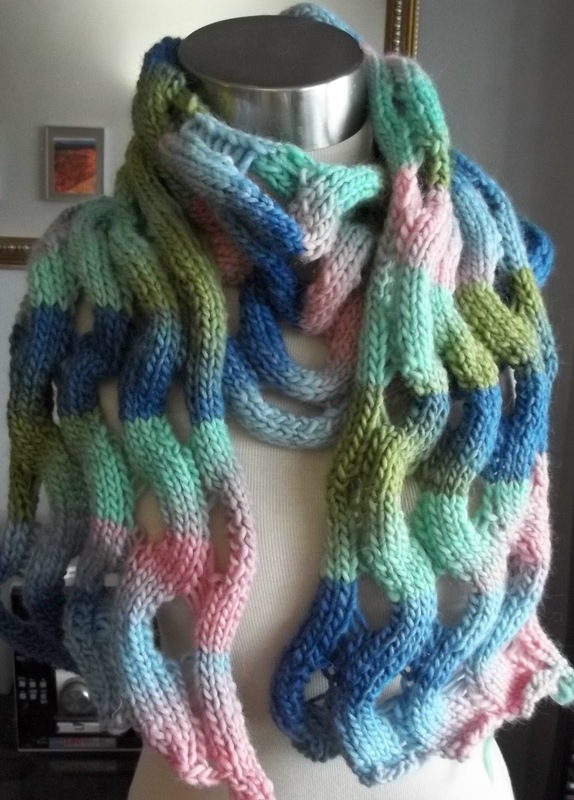 Like you, I can't say I am a fan of knitting scarves but this one I might break a rule for! And I think your use of the long color changing yarn was brilliant. Oh that is gorgeous! Great job! I can't wait to see you new outdoor "room" either. I am consolidating plants. I have to make some room outdoors for my fold up rocking chair. Gratz on your weight loss. You'll be light as a feather soon. Good for you! And maybe I'll join a pool this summer, too. There's one nearby. 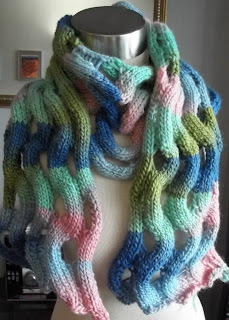 Hi love the scarf, is there a pattern for the Wavy Ribbons scarf ? So pretty!